Rio Grande’s Ewan McLauchlan (10) dives for the ball during the first half of Saturday’s 4-0 win over Lawrence Tech University in the opening round of the NAIA Men’s Soccer National Championship at Evan E. Davis Field. RIO GRANDE, Ohio — Four different players scored second half goals to lead the University of Rio Grande in a 4-0 win over Lawrence Technological (Mich.) University, Saturday afternoon, in the opening round of the NAIA Men’s Soccer National Championship at Evan E. Davis Field. Rio Grande, the tourney’s No. 4 seed, improved to 19-0 with the victory and will next face 13th-seeded Southern Oregon in round two on Monday, Nov. 26, at 2 p.m. EST, at Orange County Great Park Soccer Complex in Irvine, Calif.
Southern Oregon posted a 1-0 win over UC-Merced in one of Saturday’s other first round contests. 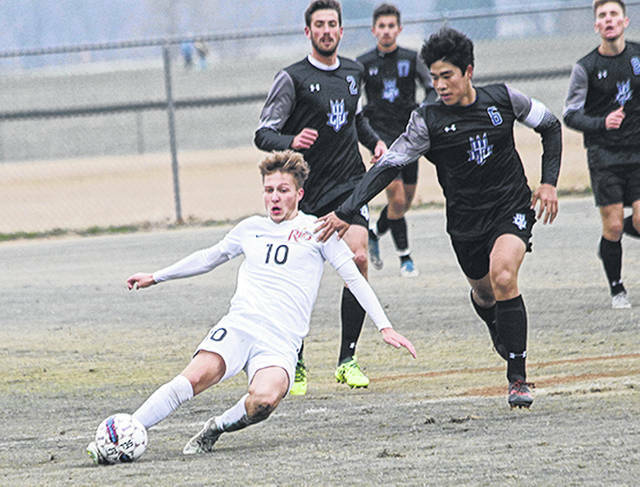 Lawrence Tech, which was making its first national tournament appearance, ended its season at 14-7-1 with the loss. Despite being limited to just one shot, the Blue Devils hung tough in a scoreless first half. But Rio Grande, which failed to score in the opening period for just the second time all season, roared to life after the break by scoring its first three goals in a span of just over six minutes. Sophomore Ewan McLauchlan (Aroch, Scotland) got the scoring underway when he gathered in a centering pass from freshman Nicolas Cam Orellana (Santiago, Chile) about 15 yards out on the left side of the 18-yard box and chipped a shot which cleared the head of LTU goal keeper Max Jewett for a 1-0 lead with 29:58 remaining in the game. Senior Harry Reilly (Coventry, England) made it 2-0 just over 5-1/2 minutes later, scoring from the right wing off a pass from the top of the 18 by fellow senior Eduardo Zurita (Sant Boi de Llobregat, Spain), while freshman Joe Quayle (Isle of Man, United Kingdom) pushed the advantage to 3-0 just 27 seconds when he scored on the rebound of a shot by Zurita which was blocked by Jewett. Freshman Manyumow Achol (Wellington, New Zealand) set the final score with a goal off a pass from sophomore Samuel Pedersen (Aldershot, England) with 8:26 left to play. Rio Grande finished with a 19-5 edge in shots, including a 9-2 edge in shots on frame. Junior Richard Dearle (Castle Donington, England) recorded two saves in goal for the RedStorm. Jewett had five stops in a losing cause for the Blue Devils.